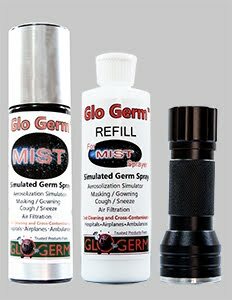 Save $6 by purchasing the Glo Germ mist spray and refill bottle together. Glo Germ Mist spray bottle. Non-aerosol, pump bottle allows for cough and sneeze demonstration for germ spreading. 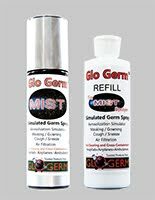 Use the Glo Germ Mist refill bottle to fill your mist pump spray. Using the refill saves you from buying a new pump bottle each time. Get a complete infection control training kit with the Mist Basic Kit. You get a Mist spray, refill bottle, and a UV black light. 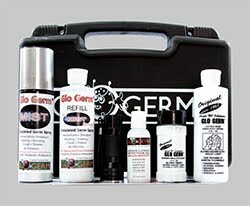 This Glo Germ Mist Deluxe Kit includes that following: Glo Germ MIST Spray Canister, MIST Refill (8 oz), Glo Germ Gel (8 oz), Glo Germ Powder, Surface Cleaning Detection Gel (2 oz) and a 21 LED UV Flashlight all in an easy to carry case. Use it for classrooms, restaurants, hazmat training, food handling classes, hospitals, and so forth. Glo Germ Mist is a new form of Glo Germ (fluorescent simulation germs). The mist comes in a non aerosol (good for the environment), pump spray can. Glo Germ Mist spray can is easily refillable for your continued use. The spray glows under a UV black light, showing where and how far germs can travel. Some think that sneezing and coughing doesn't spread germs like health professionals report, but see for yourself! Airborne microbes can contaminate rooms, vehicles, and other public places. Who should use Glo Germ Mist?